By coupling our awareness and intent with sound, we can alter our perception of, if not our very reality. We each have a role to play in this changing world. Our choices create an impact on the very nature of Creation. In holding the most positive vision, or Dream, of how we would like the world to be, and act accordingly, in harmony with that vision, we assist in bringing it into reality. Sound and consciousness are intimate parts of that new reality. Join us, as we 'Dream the New Dream!" Zacciah serves as general director and Director of Programming for All One Now and World Sound Organizations. Zacciah co-founded the World Sound Healing Organization and All One Now Network with Annie B. Bond, first at her invitation to bring forward his unique qualities of Sacred Sound Ceremonies, specifically for Earth Healing, to others via a live web broadcast. It was both their vision to expand the work to incorporate the wisdom and teachings of reknowned leaders in human growth, and indigenous elders and their traditional teachings and ceremonies, to broaden an understanding of the Earth, Her Beauty, and Her many peoples treasured ways of interacting with Her, and the Great Mystery of Life. Zacciah continues to occasionally offer healing ceremonies in partnership with other events of the organization. Zacciah Blackburn, Ph.D., is a gifted intuitive, teacher, sound healer, and Sacred Sound channel, trained in classical healing and shamanic traditions, and Sacred Sound cultures. He teaches internationally, and practices in Vermont, USA, at the Center of Light Institute of Sound Healing and Shamanic Studies. Zacciah shares authentic trainings in the nature of human consciousness, authentic being, explorations into the Shamanic worlds of Earth Energies & awareness, and teachings on the nature of sound, and Sacred Sound practices, as a therapeutic healing modality. His in depth understanding provides life transforming experiences into the authentic nature, being, and wellness of who we are as spiritual beings. He is Director of Education at the International Sound Healing Network, & co-founder & Director of the World Sound Healing and All One Now Network of organizations working for global peace, as well as a working Board Member of the Sound and Music Alliance. He also offers musical instruments of sacred sound cultures, & sound healing tools, at www.sunreed.com. His primary website for programs of study in Sound Healing and Therapies, Earth Mysteries and Shamanic Practices, and Esoteric Studies for Spiritual Attainment, are at www.thecenteroflight.net. The programs Zacciah offers have been highly praised for their authenticity in content, and the ability to bring others into direct spiritual realization of their own authentic nature and relationship with the Divine. His work in sound healing therapies training is inspirational, deeply intuitive, yet full of understanding that is easily imparted and understood. He is one of the few practitioners offering a full training in the intuitive arts of sound healing therapies that can stand alone as a therapeutic application, or be applied to many of the current modalities of the healing arts, such as psychotherapy, nursing, body wellness systems, including massage, reiki, craniosacral, chiropractic, the shamanic arts, etc. Zacciah is, also, Director of Education at the International Sound Healing Network, (formerly the New England Sound Healing Research Institute, see www.soundhealingnetwork.org) a world wide community of healing practitioners broadening the awareness of sound healing through networking, education, and scientific research. Times a Year, The weeks surrounding the Earth's Equinoxes and Solstices. 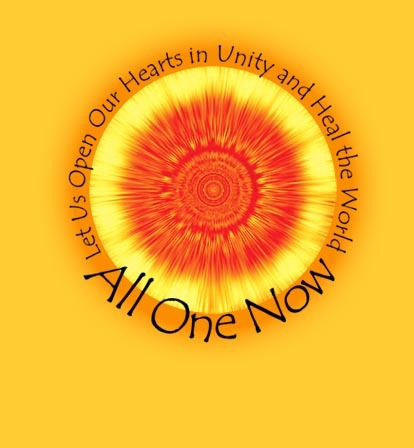 All One Now is a venture of World Sound Healing , in co-operation with other individuals and organizations. of Spectrum Arts and Education for Peace, inc., dedicated to world peace.